Gift Guide is a recurring segment on Wicked Horror where we showcase horror inspired gift ideas for you or the horror fan in your life. Have an idea for something we should feature? Let us know in the comments below. On this installment of Gift Guide, we are featuring a set of handmade horror movie coasters. 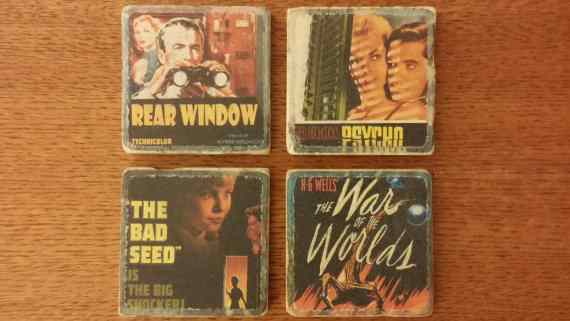 They come as a four pack at a discounted rate but the Etsy seller also offers horror inspired coasters as an individual purchase. The four pack will run you $30.00 or you can buy individual coasters at $10.00 apiece. This set of items is available through My Creative Suite on Etsy. If you decide to pick one of these up, post of a photo of it in the comments box below and we will share on the site.